This Brand New Highlander Garden Shed is one of Absco's best selling models and will definitely make your life easier. 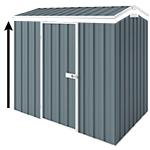 The Absco Highlander range of our garden sheds is manufactured from low maintenance ribbed steel sheeting and is designed to add value to your home. For permanent secure installation of your shed it is recommended to use anchors. To secure your wall panels to the concrete slab, you will need 24 anchors for this 3m x 6m Highlander shed.